When you think about Poodles we bet you probably think about their curly coils covering their bodies and the standard Poodle cut with the puffy and bushy feet and ears. Yeah, we think of that too. 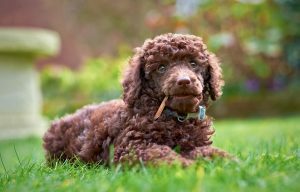 Our Miniature Poodle puppies don’t quite look like that yet, but with age and grooming, they too can reach the ideal Poodle stylistic status! Okay, we kid around a bit but we also know that people love Poodle because of their beautiful looks and intelligence. Here are a few more reasons to love them that you probably didn’t know or even consider about their stylish coats! They made fashion statements, but not on purpose. Because of the style of their hair, Miniature Poodles for sale became so popular that pop culture named the “Poodle skirt” after them! They were a craze that took over the fashion world. Speaking of the fashionable Poodle, we already mentioned their famous and natural hairstyles, which also happy to be hypoallergenic. Keep them groomed and washed often, especially if you have white or light colored ones. They have a tendency of turning a brassy or a yellow color prematurely, though it’s part of their natural aging process. You’ll find that Miniature Poodle puppies come with coats of many different colors including black, white, gray, silver, brown, and cream. Their colors will change as they grow from puppies to adults. The American Kennel Club only allows four specific clip styles for competitions. Mini Poodles for sale are born with coats that change as they mature. It is much softer and less curly. Apply a coat conditioner to your Poodle to keep her hair soft and tangle free. Because their coat is so curly, ingrown hairs are fairly common among Poodles. These are just some of the hairy facts surrounding these puffy pooches. For more information on grooming our Miniature Poodle puppies once they’re home with you, keep checking back on our blog!